"Most RSS readers remind the user, all the time, how wrong he or she is. Or inadequate or lazy or behind in their work." 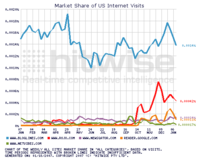 And as Michael Arrington (TechCrunch) shows in a recent post, this is reflected a bit in the sideways charts of the traffic at popular news readers. Bloglines, which I've used for years, but less and less as of late, reminds me every time I log in how ridiculously behind I am in reading my hundreds of subscriptions. And then when I get goaded into getting organized and caught up, everything I click on takes ages to open and shut. Google Reader, which I've migrated to of late, is a bit better in that it doesn't give you messages like "927 feeds Unread (you lazy, good-for-nothing, ignoramus)". And it also has latency issues in terms of opening and closing branches of items to be read and consumed. However, it does have some potentially user-friendly new features like it's "Feed Bundles", which allow you to subscribe to clusters of popular sites around topics like "Science", "News" etc. But then the interface still reminds me of my cluttered closet every time I launch the reader. There's tons of stuff in there I probably need, IF I made the time to go through it all, organize it, and KEEP IT organized going forward. As Amit Agarwal intimates correctly in the title of his post on the subject, RSS readers today cause nothing but stress in users' online lives. (Beth Kanter also has a post RSS stress as well). Forget Alphabetic sorting, number the feeds"
I shouldn't have to do all that. My software should self-organize automatically around me. (And as my wife often reminds me, my closet certainly isn't going to automatically self-organize around me any time soon). "9/20/05: "Let the news flow by you and relax like someone sitting on the bank of a river looking for something interesting as you while away the time. That's how news works, and RSS is, emphatically, for news." "Imagine you're fishing, and there was some nerd on the other side of the river, shouting at you, the number of fish that went by that you didn't catch. How long before you'd want to kill the nerd??" And that's where we seem to be at with News Readers. Designed by nerds, mostly for nerds, who are generally obsessed with all things online, to be gotten online. It's all the more important to address this, because while RSS readers primarily drive rivers of text to their subscribers today, very soon they'll be driving video to them tomorrow. As Mark Cuban aptly suggests in a post yesterday, it's not going to be long before mainstream cable and media offer subscription streams for every imaginable type of video content, coming into your DVR and/or home server. And it's not just subscription services to PC or even TVs anymore. Let's not forget SMS subscriptions on your cell phones (or mobiles as they're known overseas). It's time we re-thought feeds readers of all types for mainstream folks, and really reduce the stress in their online lives. That is exactly why we created BuzzTracker -- to take what sites like TechMeme or RealClearPolitics are doing in saving you time and expand it to every topic of your choice -- you can use it ( http://www.buzztracker.com ) to track everything from India, to Software as a Service to Microsoft to the Chicago Bears -- we will always surface to you a combination of the most blogged stories as well as the latest news from the top 90K content sources out there. Even better -- we're soon to launch a Create A Topic feature to track your *specific* topic using the same techniques we use from our vast list of content sources. Check it out -- would love your feedback. And one more point --- which I think is a real issue -- is that a very very low percentage of the overall population knows what RSS is let alone what an RSS reader is -- I think services like ours must emerge if the long tail is really going to come to fruition from a news perspective. The vast majority of people will not sign up for hundreds of feeds -- but they will be searching and looking for topics and information relevant to that topic. I am not saying we're there yet -- but it was this premise that drove our design (can we pass the "Mom test" as far as usability goes) -- and we like the direction we've started down. It was basically just news news news, three columns and all the feeds on one page in one gigantic stream of data. It was fantastic, because you didn't have to read it all or mark it read or organize anything.